Because prepping for my very first WorldCon and the Hugo Awards and a Full Moon Jam, as well as working on Uncanny Magazine Issue Twelve AND getting Uncanny‘s Year Three Kickstarter to the finish line next week isn’t enough on my plate, I’ll also be discussing the finer points of building a healthy, inclusive nerd community at the Chicago Nerd Comedy Festival, taking place at Stage 773 in Lakeview, this coming Sunday, August 14, from 6-7pm. I’m pleased to note that I’ll be joined by fellow CNSCer Matthew Peters (Mighty Ink Comics), as well as Tamara Lynn Chambers, with Jackson Bird moderating. 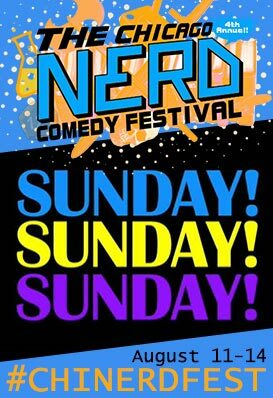 Be sure to check out the many events and performances being offered during #ChiNerdFest, there’s a lot of nerdy hilarity to be found. Please do come on out and join us! This entry was posted in Culture, Panel and tagged Chicago Nerd Comedy Festival, ChiNerdFest, community building, panels by Michi Trota. Bookmark the permalink.